Aside from the recent 'do they or don't they boost battery life' controversy over solid-state drives for PCs, one of the other concerns about SSDs has been their very finite lifespan. 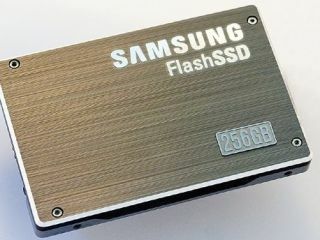 The NOR and NAND flash memory used by SSD builders typically can be written to only half a million or so times, after which they give up the ghost. While this means an SSD will probably last longer than any home computer in which it finds itself, server computers need something a little more robust, which is where Samsung comes in. Working with Sun Microsystems, the Korean firm has come up with a NAND chip that will last five times longer than standard flash memory. It says this makes it ideal for servers in businesses that need to know they can rely on their IT infrastructure. Such operations might include SSD-based machines that power search engines, video streaming or any other high-demand computing. One more improvement sees the new memory able to handle 100 times more data transfers per Watt of power consumed than standard hard drives. The substantial power saving is sure to open as many eyes as the increased durability.